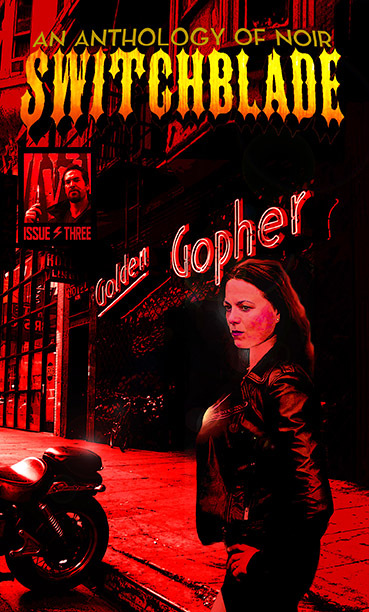 Switchblade Issue III boasts a number of contributors familiar to anyone who follows the small press crime scene, writers like Eric Beetner, Morgan Boyd and Preston Lang. As well, there are a number of writers I know mostly from their Twitter feeds and the occasional scuttlebutt. I realize it's still early on in Switchblade's career, but it's safe to say they've become prominent in a short time. All told, editor Scotch Rutherford has put together a well-done and entertaining issue here. Some highlights include the aforementioned Preston Lang, who gives us "Press it Down," a story about a former musician turned mayhem artist, a granny who turns out to be skilled in the use of a golf club. I've found his stories always deserve more love than they receive: he's well-published, but merits further recognition, and kudos to Rutherford for recognizing that and giving him a spot in multiple issues. In "Burning Snow," Morgan Boyd writes about how even a simple job like shoveling snow can become a criminal web of intrigue and violence. Told by our narrator Max, who's got a secret or two himself, the story ranges across the snowy landscape, artfully and simply revealed, to an unforgettable description of a fat man in flagrante delicto. The ending is a punch in the gut that tells us what some of us could still stand to learn: some people never have the luck. Eric Beetner's piece, "Family Secrets," about a child who witnesses a gruesome crime and is forced into a criminal act himself, is something I've found typical of Beetner, in novel or short story mode. His work is well-paced and deftly written, always in service to the narrative, not flashy. It's solid prose exemplified by lines like "I didn't buy the fake sincerity in Mom's voice when she told me Dad would be okay. But beyond wondering if my Dad would live or die, I tried to figure out how in the world he ever come to be shot." Other stories are largely successful but not necessarily my bag. I recognize the effort each of the writers here, though, and I appreciate too the effort it takes to put out a quality journal several times a year. It's an often Herculean effort sustained only by the love you get from writers and occasionally from readers, and certainly not in monetary rewards. The kinks in the production process notwithstanding, I expect Switchblade to have a long successful career highlighting the best the small press crime scene has to offer for as long as Rutherford can keep the magic going on the back end. The stories are out there waiting, and I see the job of small press crime journals like Switchblade, Pulp Modern and Tough to bring them to the forefront and provide an alternative--however the individual journals define that-- to the larger venue/larger payday every writer generally shoots for. Our job is to get large in vision, but stay small in practice, to highlight writers before they reach mainstream success, and to bring attention to those mainstream writers who still need the boost. Their success is our success. Every Switchblade issue, every Pulp Modern issue, every story, every time we get our names out there in the small press crime scene, is a success for all of us.